Wouldn’t it be great if you could let everyone know just how much you love Brazilian Jiu-Jitsu? I mean apart from all the daily babble on the subject that has people rolling their eyes. Let’s face it, BJJ takes over our lives and we’re glad to let it. Our addiction to the Gentle Art is apparent in almost every aspect of our daily lives, not just on the mats. That said, it is the small things in life that bring us the most pleasure. It is the same when BJJ is life and BJJ accessories are those small things that make us smile. To that extent, we take a look at some of the best BJJ accessories that can make your life better. When we’re talking about the best BJJ accessories, we’re talking about things from every aspect of life. 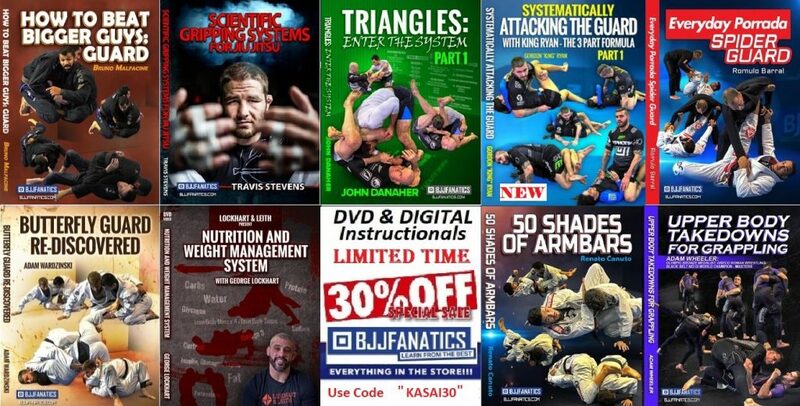 It is not just about your T-shirt or cauliflower ears but also about stuff like your coffee mug, your car keys keychain, your toddler’s onesie… You can represent Jiu-Jitsu in virtually every aspect of your life outside the mats. Now, whether you decide to go with representing your Academy, or simply letting everyone know how much you love BJJ, the choice is yours. To make things easier, we’ll offer some key accessories that will leave no doubt about where your allegiances lay. Just like with everything else, our lifestyles are highly customized in the world we live in. Everyone likes to both express their individuality and, at the same time, belonging to a group. 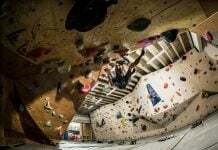 Young people nowadays belong to one or more of a thousand currents or affiliations. 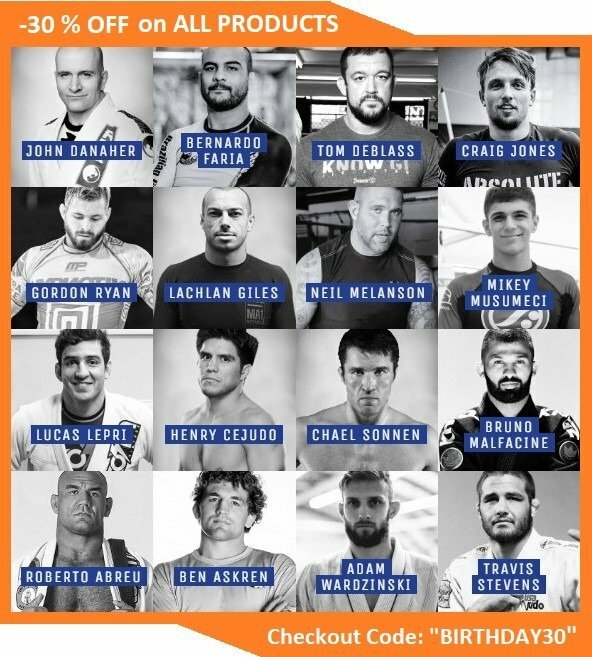 Being part of the ever-growing BJJ community is certainly one of the best, but I’m very biased so it’s an answer you’d expect. Still, the BJJ lifestyle is about a lot more than just throwing Shaka signs and cramming in acai bowl after acai bowl. First and foremost we have to talk about conduct. no amount of BJJ accessories is going to make you a good ambassador of the sport if you do not know how to conduct yourself. BJJ is about respect, positivity, and sportsmanship. The “no ego” talk so often heard on the mats should actually be an approach we take in every occasion. That said, there’s no point in living the BJJ lifestyle if we can’t proudly display it for everyone to see. it’s not ego, it’s just love of what has us going every day. Granted, as grapplers, we’re really hard to talk to for “regular” people. We tend to bring Jiu-Jitsu, not every conversation, although, in our defense, not really intentionally. Still, there are other ways to portray our love for the sport. People tend to notice the small things much more than pay attention to a subject they’re not interested in. So, get the best BJJ accessories to both express your grappling lifestyle, and use it to start that BJJ conversation you crave for! so what exactly are BJJ accessories? The beauty of this “category” is that it is wide open. You can consider everything to be an accessory. 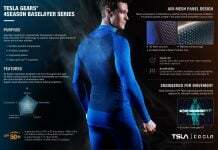 Well ok, anything apart from the equipment we need for training, and BJJ apparel that’s part of our wardrobe. After all, they’re essential parts of life or training and can’t be labeled as accessories. Everything else, on the other hand, is a go! 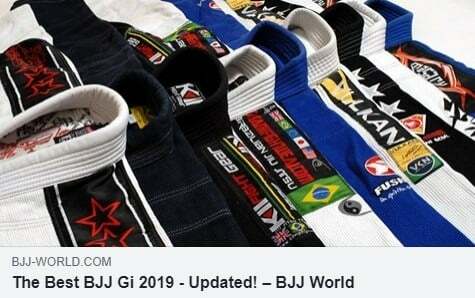 Today, we made a comprehensive list of the best BJJ accessories you can get this year. We include everything, from hats and everyday bags to patches, mugs an keychains. Whether you like a good book to add to your library or some cool new threads for your toddler, we got you covered. You’re going to get these things anyway, so why not make them about the thing you love the most? This cap is made of polyester and is fully adjustable to fit most people. it is lightweight and breathable thanks to moisture-wicking fabric and a mesh design. It is made of overall very soft material and very comfortable. 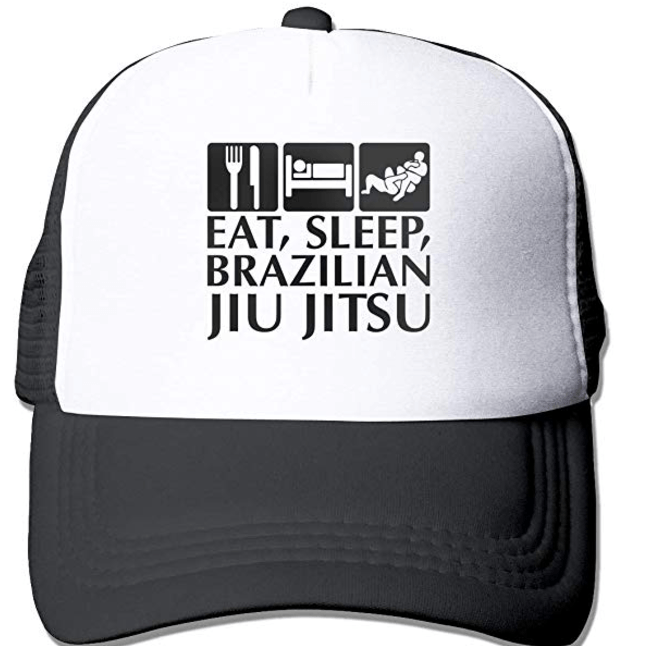 In terms of the design, it features the well known “Eat, Sleep, Brazilian Jiu-Jitsu” slogan. 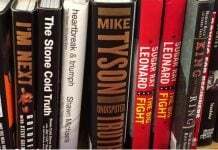 It is written in black, on a white background, with the words Jiu-Jitsu highlighted more than the others. Above the letters, there are three images, one featuring a fork and knife, the second a sleeping bed, and the third two people grappling in Gis. A great accessory and also a top gift idea! In essence, it is a belt, that features one of the usual BJJ ranks (white, blue, purple, brown and black). The way you know it is a BJJ belt and not just a generic martial arts belt is by the usual black patch at one end. In the case of this key chain, the black patch makes up half of the belt. It is a really simple and cool looking accessory that you’ll probably need to change every couple of years or so. Or, even better, buy all belt level key chains at once and be set for life! 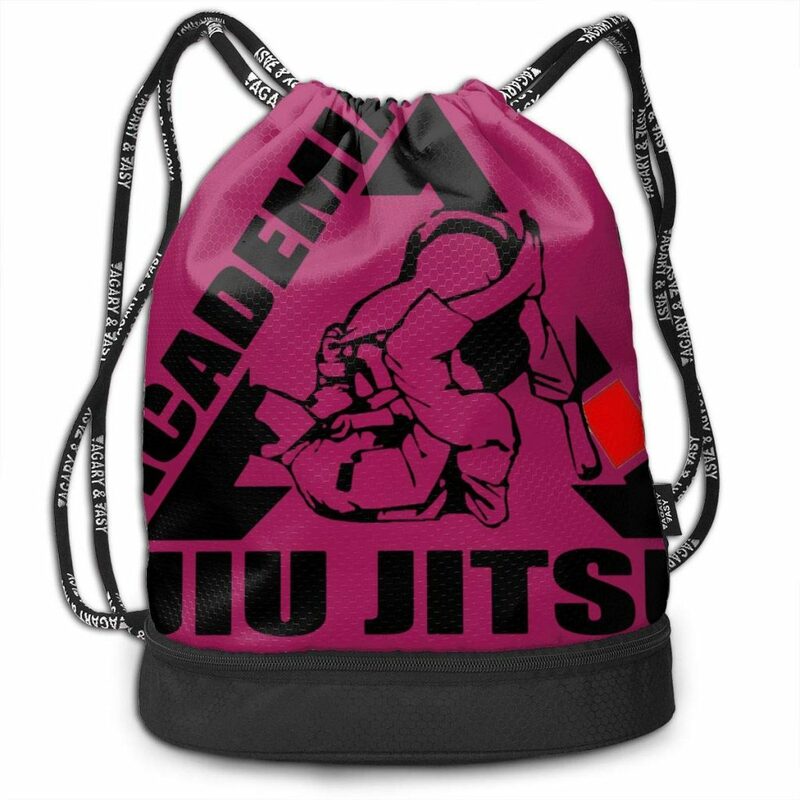 Instead of carrying your BJJ gym bag with you, choose a BJJ themed drawstring backpack instead. As far as best BJJ accessories go, I’ve been using one of these for almost a decade now and I’m more than satisfied! Today’s suggestion is a really cool black and red drawstring backpack with mesh water bottle pockets. 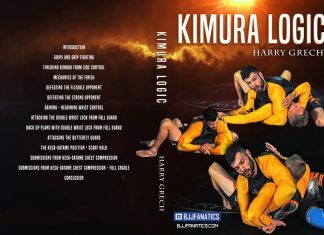 It features a sublimated theme of two grapplers engaged in a match, with one having the other in an armbar from the back. the words Jiu-Jitsu also feature across the face of the backpack. The material is 100% polyester, machine washable and extremely lightweight. A real caveat is the large zip pocket at the bottom that can hold anything, from your belt if you’re going training, to your phone or an umbrella. What you get with this one is a premium material bag that comes in black. It is made out of canvas with leather. the bag is water-resistant, ultra durable and long-lasting. The bag has a very large capacity and can easily fit anything you might need on a daily basis. It has a huge main compartment that has a zipper on top, In it, there are two smaller pockets, also with zipper closures. 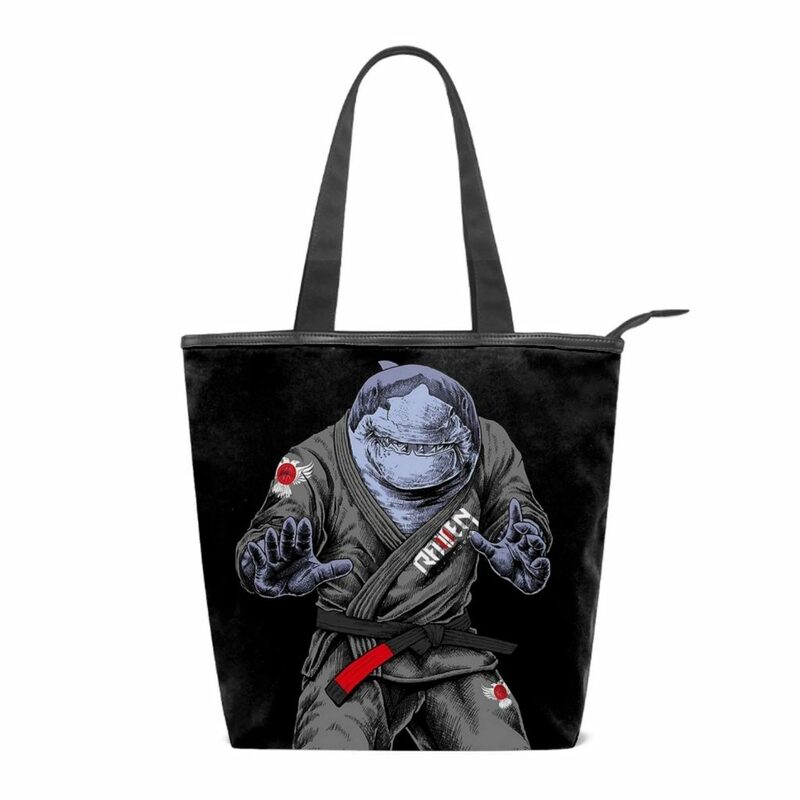 The design has a cool drawing of a BJJ shark, meaning a human(ish) body with a shark’s head wearing a Gi. Something different for sure! First and foremost, this shell is completely bump-proof and highly protective. It also features an enhanced grip, as well as an anti-scratch surface. 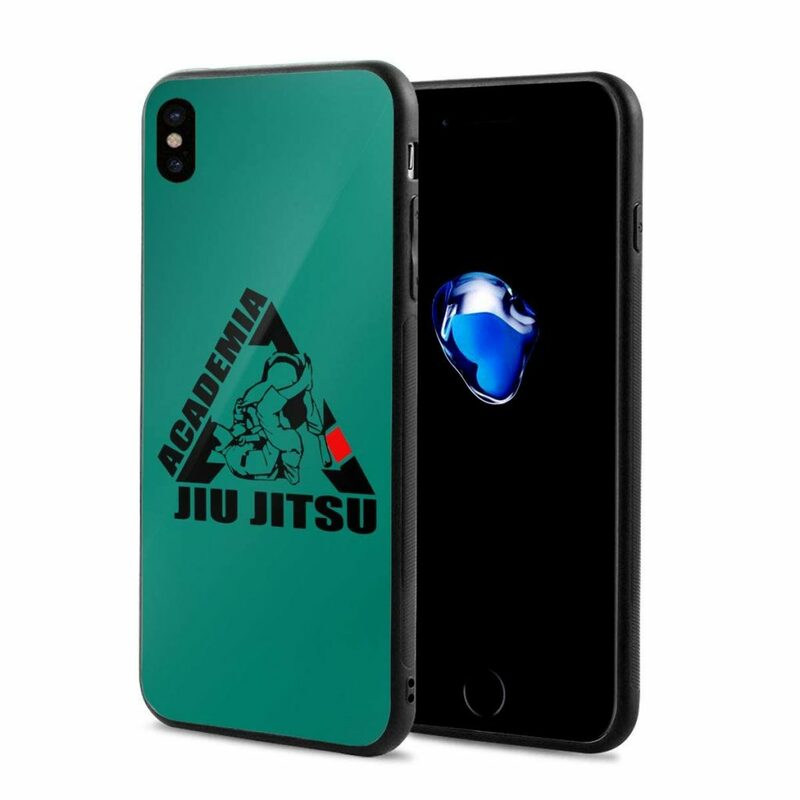 The design has a couple of grapplers in a match, while letters say “Academia Ju-Jitsu”. Everything is in black, apart from a red decoration on the edge of the triangle frame. The shell itself comes in a dark green color, working perfectly with the drawing. This case has precise cutouts to make sure it can hold any iPhone ranging from 6 to 8+. The design is also a particularly cool one. 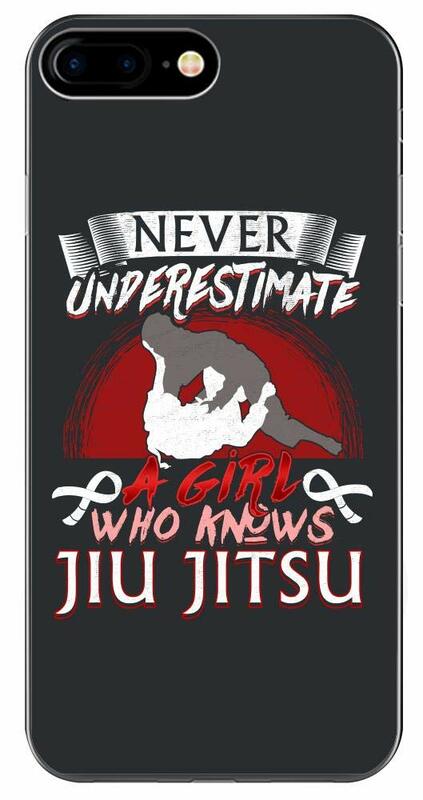 Basically, it reads “never underestimate a girl who knows Jiu-Jitsu”. the letters are arranged on top and bottom of an image depicting two girls grappling. Lots of colors and overall awesome design are the marks of this BJJ accessory. This particular patch is a badge that has a circular shape. It is black, with a yellow border running around its circumference. 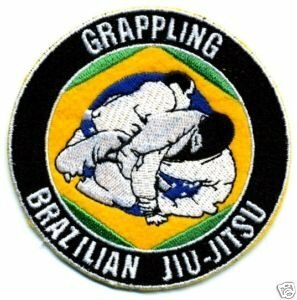 Letters that read “Grappling Brazillian Jiu-Jitsu” feature at the top and bottom. An inner circle portrays a couple of grapplers going at it, with a closed guard Kimura set up along the way. A yellow background takes over form the black in this center circle. Everything is embroidered and impossible to fade or peel off. This onesie is intended for children aged 6-24 months. It is 100% cotton with a special collar design. A footless bottom guarantees free movement and extra comfort. The design is unisex so its great for both boys and girls. It has long sleeves and comes in black color. The front area has a submitted design of the Brazilian flag. 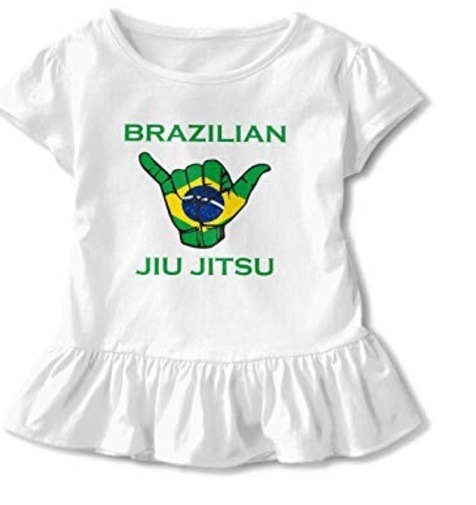 Above it, letters read “Brazilian”, while below it is the magic words “Jiu-Jitsu”. Available in sizes 2T-18M. The design is one of the grappling-famous Shaka sign. the whole hand doing the sign is in the middle of the tunic, painted in the design of the Brazilian flag. The inevitable “Brazilian Jiu-Jitsu” letters, this time in green are over and under the image. The tunic is easy to dress up or down, it can be worn on its own or under a blazer. 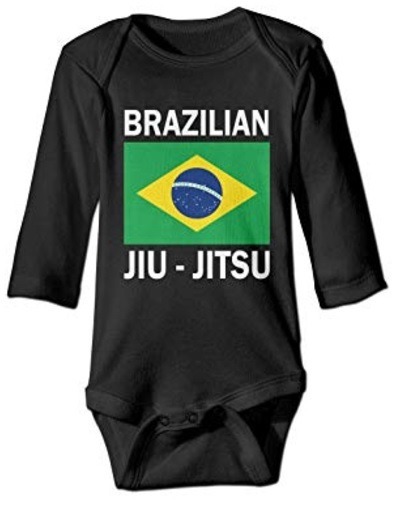 A stylish look for your child and a fix of BJJ for yourself. This mug is a simple yet really cool one. It has an 11 oz capacity and comes in a white color. The five adult belt colors run horizontally, with white on the bottom and black all the way up. In front of each bel,t there’s an empty checkbox. The writing on the top says “What’s Your BJJ Rank? 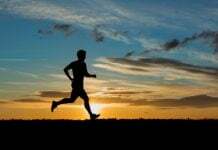 Mark Your Answer And Start Training”. Now, whether you decide to mark your answer, or leave it as it is down to you. 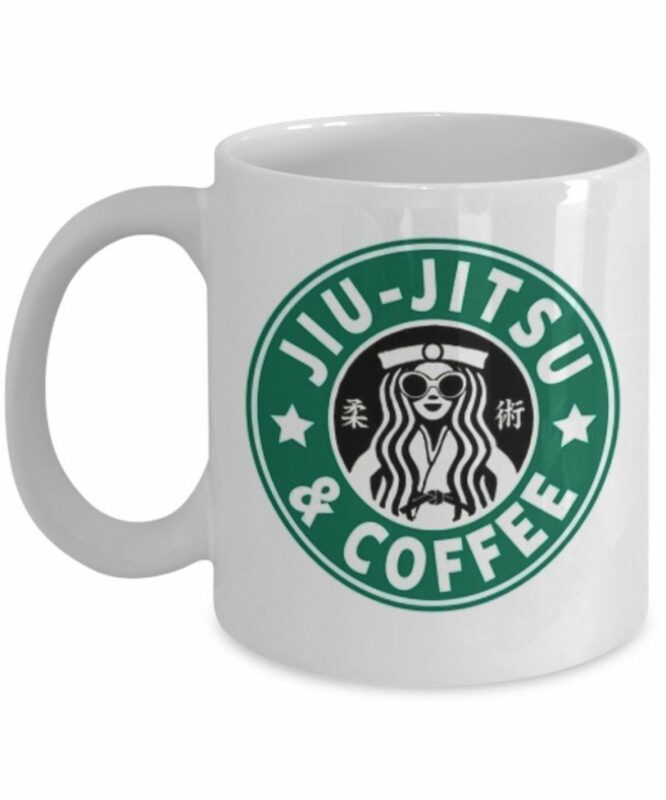 As far as we’re concerned, this is definitely one of the top BJJ mugs you can get. 100% Dishwasher and microwave safe. This mug comes in two possible sizes, one that can hold 11 oz, and another with a capacity of 15oz. The mug is of the highest quality, as is the printed image. Comes with a guarantee that the image will never fade or peel off. 100 % Dishwasher and Microwave safe. A simple and subtle cup for any coffee loving grappler out there. This simple bumper sticker features a couple of grapplers performing the armbar. 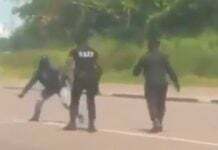 In this case, it is the mounted armbar, and one grappler has the extended arm of the other. The bumper sticker is white and is 5″ big. it has a state of the art adhesive that ensures it sticks to any surface you put it on. The print is also really precise, printed at 1440 dpi. The sticker will easily withstand sunlight, moisture, wind, etc, never fading or coming off. Made in the USA. 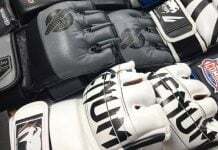 While our list of the best BJJ accessories is the most comprehensive one yet, it does not show every possible accessory. Nor is there any guide that can include them all. If your preference is to represent your own Academy, then your shopping is easy, yet limited to what they have on offer. If not, the sky is the limit, and we have everything between here and there that you might consider as fun and cool BJJ accessory!